By Dale Johnson Posted: December 12, 2017 1:30 p.m. 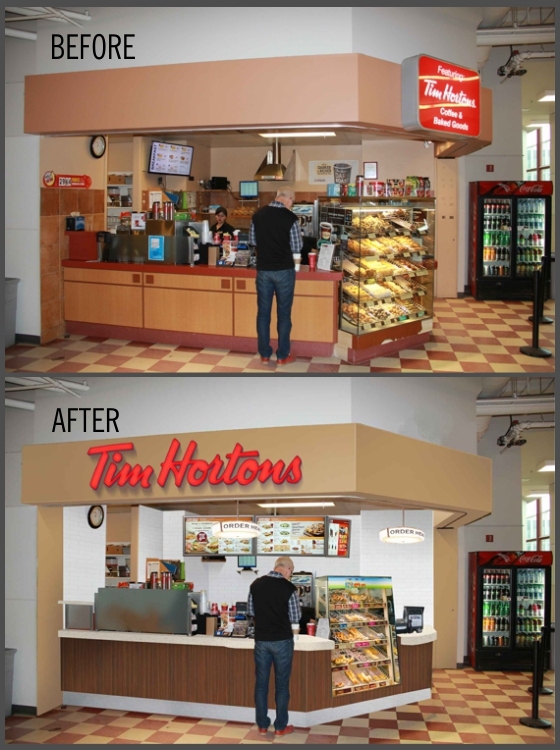 If you like to start your day with a Timmy’s coffee, get ready to start the new year with changes at Tim Hortons in the Riddell Centre. For the rest of 2017 construction crews are busy rebuilding the popular campus coffee stop. It’s not a matter of just refreshing the space; it’s a total rebuild with walls and counters being removed to make way for an entirely new Tim Hortons that will meet corporate specifications and contract obligations. Although it won’t be any bigger, it will be better. “New equipment and millwork are being installed to offer better services, additional menu options, and improved traffic flow. The entire hot beverage line, cold beverage line, and breakfast menu will be offered. There will also be improved technology for menu boards and point of sale system,” explains Bettina Welsh, Director of Student Affairs Operations. Since this Tim Hortons location opened more than 10 years ago, there have been very few improvements, other than equipment renewal and maintenance. The renovations will also mean benefits for employees. “There will be enhanced working conditions for moving around the limited foot print,” Welsh says. While the renovation work is going on, people can grab a coffee at other locations including the Lab Cafe, Kīšik Towers or Common Ground in the Riddell Centre. Then get set on January 4, 2018, to grab your morning coffee and goodies in an all-new facility in an old, familiar location.